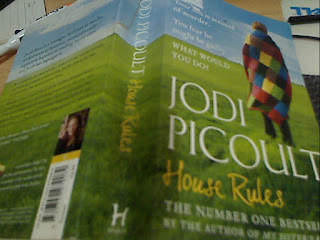 Initially, I wanted to read another title of Jodi Picoult I have in my collection but for some reason I was drawn to House Rules. I obtained this copy during a book exchange with another reader. House Rules is quite a captivating read. and I was really engrossed in this book and in the lives of Jacob and Emma and Theo. There are so many moments of sadness, exasperation, funny moments and thought provoking moments. Emma is a woman of strength and trying to make the best of a situation. She won't want your pity but she would appreciate your understanding. Whereas Jacob just wants to be one of the boys and being accepted while Theo just wants a 'normal' family and it can be said that because of all these wants that things turn out the way it did. The ending was rather abrupt and unexpected but I guess the author has written all that she wants to write.